Is NON-FICTION the NEW fiction? 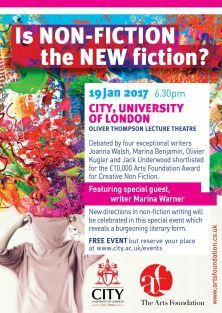 Join us for this special one-off event to celebrate the shortlist of the £10,000 Arts Foundation Creative Non-Fiction Award 2017. Internationally renowned novelist and cultural historian Marina Warner, award-winning writer and journalist Dr. Julie Wheelwright will join writers shortlisted for the Arts Foundation Creative Non-fiction Award, Marina Benjamin, Olivier Kugler, Jack Underwood and Joanna Walsh. The writers will be speaking about why they have chosen to write within creative non-fiction, a burgeoning form of literary work which often brings together such seemly disparate forms as poetry, philosophy, travel writing, memoir and reportage.Using narrative techniques often identified exclusively with fiction, they will explore through their own writing how and why this hybrid genre offers them the freedom to express their ideas and experiences that might previously have been limited to dramatic forms. The creative non-fiction genre is burgeoning in popularity in the UK. Perhaps as a reaction to the current sound bite news style, there is a new hunger for longer more in-depth pieces that allow the reader to reflect on a deeper level and where the use of literary techniques allow for an aesthetic quality to the writing. As a sign of the increasing recognition afforded to the genre, The 2015 Nobel Prize in Literature was awarded to a writer of creative non–fiction, Svetlana Alexievich. Current best-sellers in the genre include Helen MacDonald’s H is for Hawk, Chris Packham’s Fingers In The Sparkle Jar and The Optician of Lampedusa by Emma Jane Kirby. We are aware that an invitation may have gone to some of our alumni listing an incorrect date for this event. To confirm, this event will take place on Thursday 19th January. You are welcome to bring a guest to this event, please provide details below.